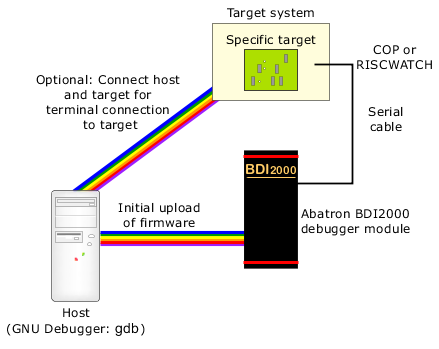 After you upload the firmware to the BDI2000 module (the serial line that you previously used is used only for the initial configuration of the BDI2000 Debugger system), you must then connect the host to the BDI2000 through the serial interface (using one of COM1 through COM4). Unplug the Abatron BDI2000 Debugger module, because it should be powered off before you connect it to the target board. Remove the serial cable from the BDI2000 and your host machine; you needed it only for the firmware update. At this point, you can connect a serial cable to your target board. Connect one end of the JTAG debugger cable to the BDI2000, and the other to the JTAG port of your target machine. The JTAG port may also be labeled COP or RISCWATCH , depending on the hardware. Run the tftpsrv.exe file in the BDI setup directory before plugging the BDI2000 back in. The TFTP server is responsible for passing the register definition files (.def) to the BDI2000 every time it powers on. Plug the BDI2000 back in. Open a terminal window and type telnet BDI_IP_ADDRESS, where BDI_IP_ADDRESS is the IP address assigned to the device. You should be greeted with a listing of all possible monitor commands. If you previously connected to your target board through a serial cable, you can now open a Telnet session to your board and type reset run into the session. You should see your target board booting up on the console.